This is the first time I have seen a military telemeter produced in kit form. This German version would have been used for large guns like the 88mm and would be quite useful for both ground and air targets. 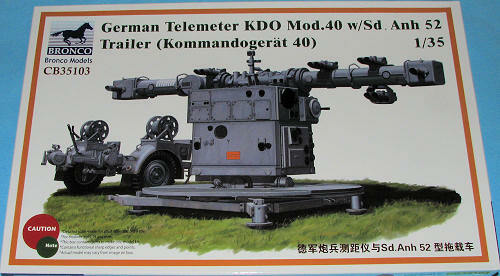 The kit includes not only the telemeter, but also its trailer. In this case it is a pretty standard Sd. Anh 52 that can be towed by vehcles of nearly any size. The detailing on the parts is very much up to Bronco's standards and includes a nice photo etch fret. This fret is used for some small handles, fender braces on the trailer and the grate standing platform for the telemeter itself. The main body of the telemeter consists of the long optical arms and the large analog range computer to which it is attached. I would have expected a clear sprue for lenses, but apparently they are not required. The kit can be built in either a deployed or a towed position. For the latter, the large grates are folded up along the side. 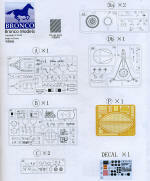 There is a small decal sheet included for various placards and instrument dials. Instructions are very nicely done with clear construction details. This can be painted just about any way that seems appropriate. Basically you have a choice of a base coat of either Panzer Grey or Panzer Tan, to which you can add other colors if you feel the need. Color references are given in a variety of paint brands so you are sure to find something locally. You can add this to the list of things a bit unusual. Perhaps it is not so odd that kits like this are being produced as most of the 'normal' armor subjects (Shermans and Germans) have already been kitted. Regardless, this is a well done kit and something that will appeal to the diorama builders. Thanks to www.dragonmodelsusa.com for the preview kit. This should be in your local hobby shop and if not, ask for it.